Ali B here! Actually, Ali A (Armstrong being my married name) but the “B” is fine and differentiates me from my lovely, long-time friend, Ali W! Well, I continue in good health and strength, for which I am very thankful, living in the most beautiful part of the world, Co. Fermanagh in N. Ireland, with my husband, Neville, and three lovely daughters. Jennifer is just 21 and at further education college doing Office Admin. Emily is 13 and at the local grammar school (scarily like FGGS was even all those years ago!) and Alexandra, 11, is in her last year of Primary school, gathering herself to embark on the next stage of her education path, probably at the same school as her older sister. Could be fun! am still teaching full-time so life is full and often too busy. I am currently the Year 5 teacher (8-9 year olds) in the local Primary school and do enjoy, for the most part, the challenges that that brings. But stability in the workplace is becoming less certain and the pressures of day-to-day living for young people (not to mention the old!) do even find their way into this small rural area. However, it is certainly not all that bad and I am grateful for the friendly and tight-knit community in which I live and work and that I still have a job so close to home. Leisure time, when I find I have energy to spare after the usual chores (still there even with 3 daughters. Hmmm! ), is usually spent having a walk round the Fermanagh lakes, singing in our church choir or popping in to see a neighbour. Sounds a bit like “The Archers”! 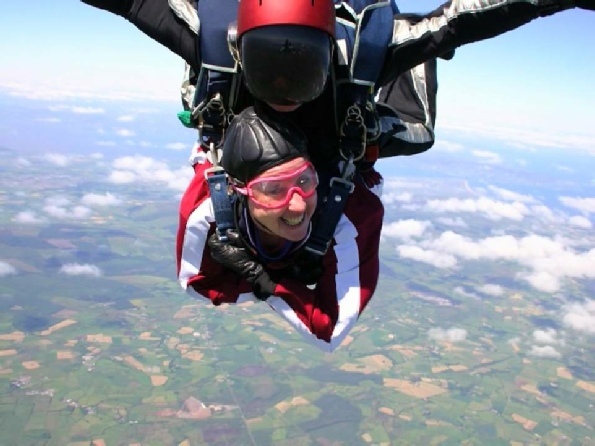 I deviated a bit from the norm last year when I celebrated my 50th birthday doing a tandem sky dive from 13,000 feet. It was fantastic and thoroughly worth all the preparation and waiting for a clear, wind-less day! And thanks to so many people’s generosity, I was able to hand over £3000+ to the Prader-Willi Syndrome Association. Jennifer suffers from this rare syndrome and every bit of help and support is appreciated. So I look forward to seeing what is in store for me over the next 10 years...!